What's Different About the New iWood Website? Our original website served us well, breaking the mould in the timber industry. We've had some great feedback on what would improve the website and we're happy to say that after months of development this new website introduces a lot of those suggestions! Every time you press "Get Next Price", a price is calculated from the options you choose in the yellow bar. Modify your choices and click "Get Next Price" again to build up your cutting list. For example, for repetitive cutting lists where only the lengths differ, after pressing "Get Next Price", all you have to do is change the length in the yellow bar and press "Get Next Price" again. Your other choices such as grade, thickness and width will stay the same, saving you a lot of typing! 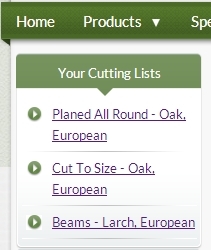 On the old website, unless you put your cutting list into the shopping basket you'd lose it if you went to a different page and came back again, which could be very frustrating. On this new website every page remembers every item you add as soon as the price is calculated. You can go to a different page or even turn your computer off for three weeks and your prices will still be waiting for you when you come back (as long as you don't clear your Internet Browser History). Products that you've worked prices out for that haven't been added to the shopping basket can be seen at the top of the left hand column of every page under the heading of "Your Cutting Lists". Most grades now have a picture that you can click-and-drag to spin around so you can view a sample from all sides. Where there are multiple grades for the same species their differences are explained. The minimum and maximum widths and lengths are also shown per grade. Providing larger versions of the 'spinners' is on the todo list. Wherever you see a price that you've worked out you have the option of putting a note against it. This can help you check off your items when they're all together in your shopping basket or just generally help you to keep organised. In your shopping basket, if you've entered notes against your items, they will be arranged alphabetically (so all items labelled with 'Job 1' would be great grouped together). Otherwise your items will be listed in the order you typed them in. Please note that these optional notes are there just for your reference and iWood can't act on anything you write in them. If you have special instructions there is a box you can write in during checkout. Thanks. 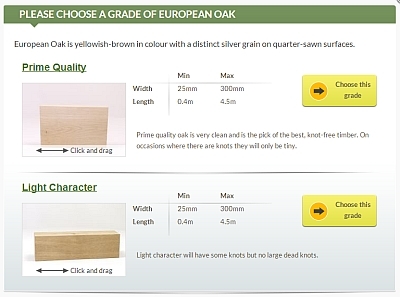 Architrave, skirting and decking now have even more attractive profiles for you to choose from. In skirting and architrave, choose from Pencil Rounded, Torus, Ogee, Chamfered and Lamb's Tongue. In Decking we now have a Reeded Profile and two different types of Anti-Slip profile, all available in two different widths. If you sign up for a free iWood website account you can save anything you add to your basket as a quote. 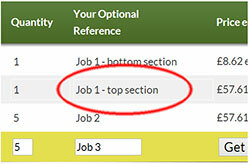 With this new website you now have the option of adding items in your basket to an existing quote. When you're logged in, visit the shopping basket when you have products in it and near the bottom of the page you'll see the Save Quotes box. If you already have one or more saved quotes, you'll have the option of selecting one to add the current shopping basket items to. We've worked hard on the checkout process to make it easier to choose your delivery area and enter your billing and delivery details with an improved address book function if you're logged in. It's also more straightforward now to create an iWood account during checkout and there's a box on the order summary page to type in any special delivery instructions. We've tried to make our £750 minimum order amount as obvious as possible to save the time (and frustration) of users not looking to buy that much timber. The minimum order amount exists because much of our timber is imported to order.